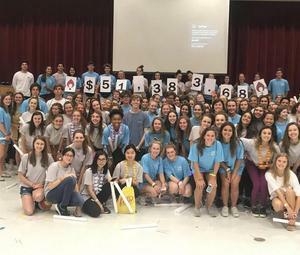 Bishop Kenny and Episcopal School of Jacksonville students united their efforts on Saturday, March 30 to hold the second combined Dance Marathon event for both schools. The six-hour dance was held in the Carla Harris Center for the Performing Arts. Approximately 260 students in grades 9-12 raised $51,384, a 51% increase over the previous year’s total. The students, united by one mission, to help sick and injured kids in the local Jacksonville community, raised funds and created awareness through Dance Marathon for two local Children’s Miracle Network hospitals, Wolfson’s Children’s Hospital and UF Health Jacksonville. The Interact Club sponsored the event. Senior Emma St. John, Dance Marathon chair, along with nine other BK Interact students and 10 Episcopal students set out to make this the best Dance Marathon to date. Lively music, fun decorations, delicious snacks, and fantastic dancing filled the night. The students are thankful for all the donors who gave so generously to help the cause.